We’re back this week and Getting Linked! This time we are experimenting with something new: sausage! And what would Portner Brewhouse be without its’ craft beer and wurst? For this round of Getting Linked, we decided to try two different varieties: a traditional brat and an apple wurst. 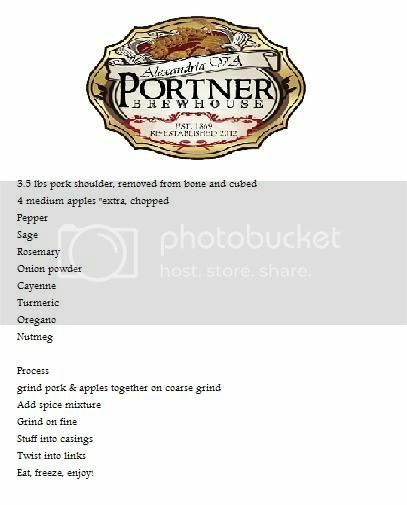 Using pork for both recipes, we chopped and cubed, then ground all the ingredients to create a delicious meld of meat and spices. Afterwards, we stuffed the casings with heaping amounts of this flavorful mixture. And Voila! See more of us Getting Linked. With making the two types, we needed two recipes. So, for the bratwurst, we used a classic German style concoction. On the other hand, for the apple wurst, we were able to be more creative, so we spiced things up with a little bit of cayenne pepper, rosemary, and nutmeg. To see the recipe, click here. And don’t forget we will be serving up some of these juicy wursts at our next Taste Test Event, so don’t forget to sign up here to become apart of the fun. Keep your eyes open for our next post, we’re brewing a Porter! Previous We’re back and we’re brewing! I wish you did not discriminate and let those of us who are 3000 miles away taste too. I am hungry. I am delighted that so much progress is being made.